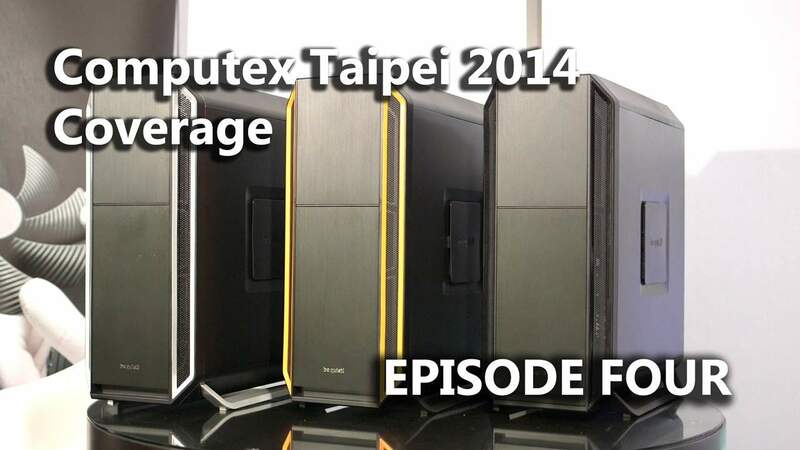 The COMPUTEX 2014 coverage continues with Episode #4. In this episode, we drop a bomb on the industry with be quiet! 's entry into the case market, check in with ASRock about their plans for X99, DDR4, USB3.1 and some other buzz words, and finally check out that Lian Li desk case that had many of you hot and bothered. We also catch up with Fractal Design whom we've missed covering at the last couple shows, and see that they've been very busy. Also featured are some amazing looking aluminum cases from Streacom, and then we finish things off with a look at a slew of new products from Kingston Technology. Episode #4 is our biggest episode yet at over 32+ minutes long. So if you have snacks and drinks, you'll want them along with you as you enjoy our latest coverage from COMPUTEX 2014. 01:02 - be quiet! drops a bomb, and enters the case market. No, this case does not have a name. But what it does have are a number of new features that should uphold the be quiet! signature brand name of silence, and performance. You'll want to see this to believe it. 07:57 - ASRock has a new high end Z97 board to show us, plus a couple of entry level boards that were released for Intel Pentium's anniversary. Their boards detect the chips, and increase the performance automatically. We also get a glimpse of their new X99 boards sporting DDR4 and USB3.1 capability. 11:18 - That Lian Li desk case has sparked all sorts of discussion, but the biggest question people had overall was, is the thing actually stable? Well, we put the case to the test and it turns out, there's nothing to worry about on that front. They are also planning on adding a third member to that family. 18:05 - We haven't visited with Fractal Design for quite some time. However, seeing them again at the show we discovered them at, really felt good, and it was also good to see they've been busy. New water cooling plus new affordable cases, should keep Fractal fans happy. 23:52 - Streacom was showing off their elegant and high quality aluminum machined enclosures at the show, and a couple things caught our eye, including a new Intel NUC enclosure that includes 3D printing plans for its faceplate, and a new, no holds barred, chassis that should create one exceptional gaming/HTPC system. 26:23 - And finishing things off is a visit to Kingston Technology, where they were showing off all sorts of high speed SSD solutions based on M.2 all the way to PCIe (and SATA in between). The new products should provide upgrades for all generations of systems, from the latest Intel Z97, to even Intel P67. And that's it for Episode #4. We certainly hope you've been enjoying Episode #1, Episode #2 and Episode #3 along the way. Stay tuned for our FIFTH and FINAL episode of COMPUTEX 2014 coverage from Taipei, Taiwan, coming up before you know it.